I designed this for my dad for Fathers’ Day. 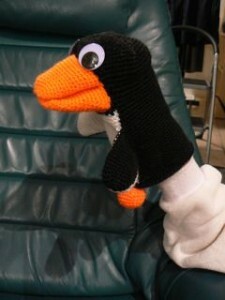 After all, what father wouldn’t want a psychotic penguin puppet? Best. Daughter. Ever. 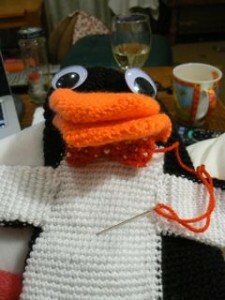 I’ve made the pattern so that you start by making a fairly normal penguin puppet. 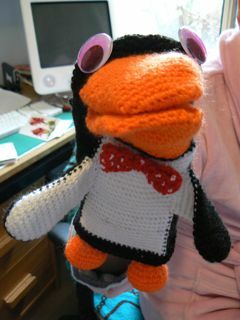 You can then choose to adapt it to make Mr Flibble by adding his bow-tie and by colouring his eyes in pink. 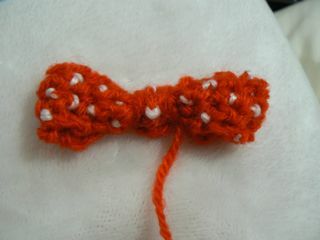 The pattern is written in American crochet notation and uses black, white, orange and red 8 ply wool and 4 mm hook. 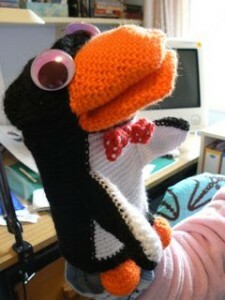 Mr Flibble is about 23 cm tall. We now need to make a hole in the head for the beak. This involves switching from rounds to rows. Rows 13 – 17: sc in the first 46 stitches (46 stitches) we are going to return to the start of this row so that we don’t change the texture of the crochet. To do this draw out the loop so that it is long enough to reach back to the start of the row. Make sure the wool you are working with is also long enough to reach back to the start of the row. 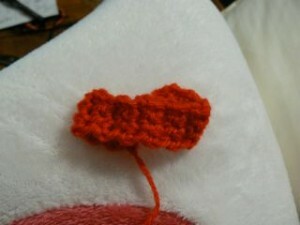 Then just pop your hook into the first stitch in the row and continue crocheting. You will be crocheting over the top of the drawn out loop and wool so that it is hidden. This is a bit fiddly but it means you will only ever be crocheting that row in one direction and the texture will look as if you are doing a round even though you a working in rows. Magic! We now go back to working in rounds and start the body. Round 9: decrease until the hole closes. Sew the beak and eyes to the head. Sew the wings and feet to the body. Fold the two ends in to the middle. Sew down. Wrap the wool around the tie tightly a little to the right of the middle. Sew in place. Repeat a little to the left of the middle. 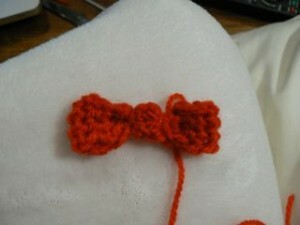 You will then hopefully have a bow tie shape. Leave the wool dangling because you will use it to attach the tie to the puppet. Use white wool to embroider some polka dots. Sew the tie onto Mr Flibble. Colour the eyes in pink with a highlighter (be careful, it will be wet for AGES afterwards). Congratulations. You now have a Mr Flibble with which to terrify your friends and family.